Outset covered all the areas we were unsure of and has given us lots of useful information. We now have the confidence to make the huge leap into self employment. 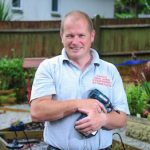 A desire to help others struggling to make ends meet was the motivation for handyman Paul Nuttall to set up his own business. With many people living on the breadline and unable to afford to get work done around the house and garden, former RAF man Paul knows only too well the need to offer good quality, low cost reliable services. Paul, who was forced to give up work to care for his wife Ali, also wanted to help the elderly and people with disabilities or those suffering from illness who are unable to do the work themselves. Paul set up his business ‘Paul’s Odd Jobs’ to offer a handyman service to people living in his local community. From painting and decoration to garden maintenance, no job is too small for Paul. Becoming his own boss also gave Paul an ideal opportunity to get himself off benefits and to do something he loves and enjoys doing. Hearing about Outset Cornwall’s programme of tailored advice and support for people looking to start their own business on local radio and through poster advertising near their home in St Ives, Cornwall, Paul and Ali decided to give Outset a call. “Outset covered all the areas we were unsure of and has given us lots of useful information. We now have the confidence to make the huge leap into self employment.